Surfboard Travel Bags. With the swells dying down as summer arrives, maybe you've got a trip planned to a destination surf spot to catch some waves. Or maybe you're already thinking about your huge winter surf trip with your family or friends. Either way, you need to make sure you've got the best surfboard travel bags around, and StoreYourBoard is now equipped with all the bags you'll need to travel with your surfboards, from bags for 1 to 4 boards and bags with wheels, we've got it all. Here are just a few of the varieties of surfboard bags that we carry. Check them all out here. 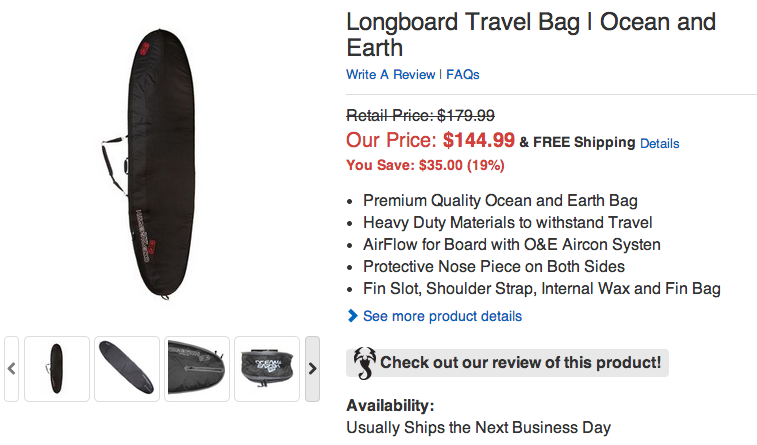 Single Surfboard Longboard Travel Bag: if you want to lug a longboard around on your trip, this is the bag for you. The bag itself is built from a triple layer technology - durable exterior, foam padding, and interior lining - to ensure that your board stays protected. And yet this surfboard travel bag is light and maneuverable enough for you when you're taking the bus from one spot to another in Central America. Protective nose inserts on both ends and internal wax and fins bags put this bag over the top. Comes in half foot sizes from 8'6" to 10"6". Compact Double Shortboard Surfboard Bag: this surfboard travel bag gives you all the protection you need for storing two surfboards, while staying compact and versatile as you're on the go. More affordable and fewer bulky extras than the premium double shortboard bag, for when you're really packing for that quick strike mission to a fast-arriving swell. Board divider to keep your boards protected when packed. Four sizes: 6'0", 6'4", 6'8" and 7'2". Premium Double Shortboard Surfboard Travel Bag: a step up from the compact shortboard double bag, the premium bag has what you need to survive the longest trips (like Bali) and the worst baggage handlers (like all of them). Still with the triple layer protection technology, the tail and nose inserts, board dividers, and everything from the other bags, but with additional features like interior and exterior straps to strap in your surfboards and your clothes and other gear that you're taking with you to make sure it doesn't smash around inside your bag. An upgrade in price along with upgrades in features and quality. 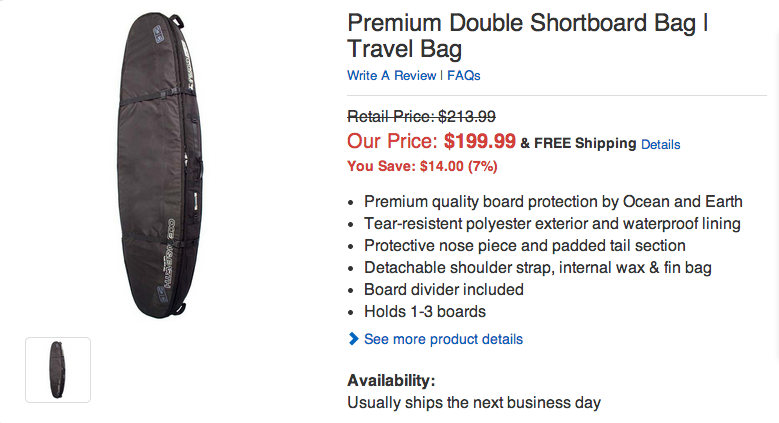 Premium Triple Shortboard Bag with Wheels: now if you're lugging the surfboards on a serious trip, and you're taking more than 1, from my experience, you need the wheels. You never know where your airline's oversized baggage checkin is going to be, and if it's a big airport, or you're walking from the parking lot, you will appreciate the wheels saving your arms and keeping them fresh for the first session when you touch down wherever you're traveling to!